This walk to Sarama village is situated in the Stavros river valley and, like the recently published PALS walk ‘Revisiting Evretou Basin’, takes advantage of ongoing works by the Ministry of Agriculture in upgrading the distribution of water resources between the country’s reservoirs. In the latter part of this pleasant circular walk the route passes through the derelict village of Sarama without having to negotiate a very rough ‘bedrock’ track and the mass of goat and sheep pens that have occupied the village for around forty years. The tracks are freshly re-laid in many parts but now firm for walking. Little shade is available along the route but, consequently, the views are far-reaching with geological features associated with a volcanic past very evident. There is one moderate upward section at the halfway mark for fifteen to twenty minutes and the walk totals a distance of 6.2kms. around two hours walking. Getting there. Coming from Polis drive through Skoulli on the B7 Paphos road and look out for the E712 on your left some 2+kms further on. From Paphos the turning is around 4.5 kms. beyond Giolou village on the right. Drive up hill, about 3km, until reaching a left turn signposted Filousa, Sarama etc. An additional brown sign for Skarfos Bridge is evident too. Drive downhill on this twisty road for approx.3kms past 3 properties on the right near the bottom and continue down. Cross the old bridge (due for replacement sometime) and immediately turn right at a T junction. Within 100 metres there is adequate parking among the Eucalyptus trees. Leaving the vehicle walk directly on for just on 0.7km, ignoring a single left turn, to reach the quarry. A somewhat, very dusty track crosses the cut-out land with its ‘office’ caravan to rise up a gentle incline for 200 metres to a slight fork. Take the right-hand direction to drop down and walk alongside the now visible Stavros River. By mid-June it is merely a trickle and will only recover after good winter rains. Pass a large rock face on the left where the track flattens out. It is high with some cave entrances and keeps you on course for a short distance before it gives way to lower hillside. Be prepared to enjoy excellent views both alongside and across the river up the terraced hillside. 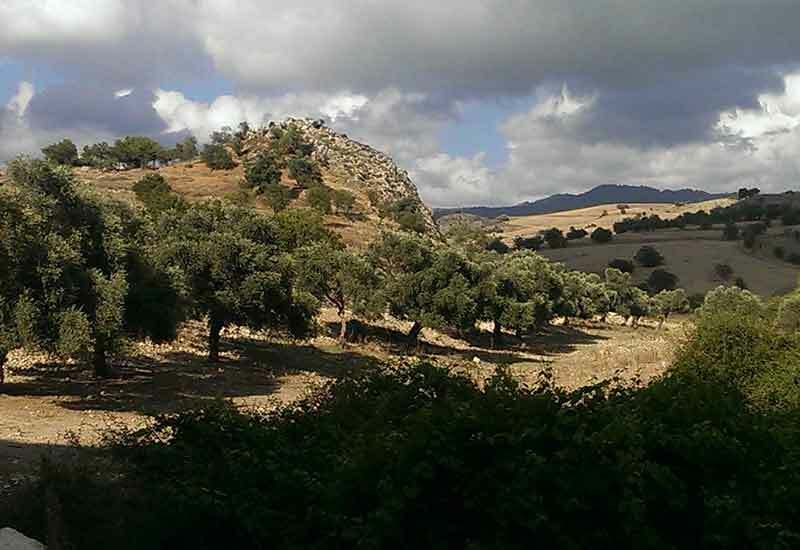 The land around is well planted with increasing numbers of vineyards to complement the lines of existing ancient olive trees. Go straight on at a crossroad signposted left, uphill for Sarama (40 mins/2.3kms). Walk on for another 15mins/0.7km on a gently inclining track, the river away to your right, and take the left uphill track that you come to. It is very apparent. Ignore a right turn off it after about 150 metres uphill and carry on walking up for 0.4km, it’s long but not steep, which will take about 10 minutes. The track ends now although it originally continued but is totally overgrown. Go left along, and across, the edge of the field that stretches before you. The field is generally used to grow cereals. The land dips and rises up as you go for 0.4km, about 10 minutes, to reach a concrete road beyond. This road connects Istinjon up to your right with Sarama down to the left, so your route is downhill all the way now to reach the old, more-or-less abandoned village now only used by families of goats, sheep and their herders with just one house seemingly in use by humans (4.6km/ approx.1.5hr). Turn right as the road reaches the derelict houses, ignoring the roadway straight on to livestock pens. Go along as the track passes expanding vineyards to the left and right as well as fields for cereal growing. After another 10 to 15 minutes look right to see the Yurts on the hillside used for holidaying/ concert venue which have become established over recent years. Across the river valley the views up towards Simou village remain stunning. The road arrives at a T-junction after another 5minutes where you join the outgoing route. Look further down towards the river and you will spot the remains of an old stone-built aqueduct which once served a water mill. Now, go right and round a gentle bend, with Eucalyptus trees overhanging, to reach your vehicle that you left some 2hours/6.2km before.